Have you used a microphone? I am thinking about getting a microphone to use with my 5-string octave viola. I've been looking at the Audio-Technica PRO-35. 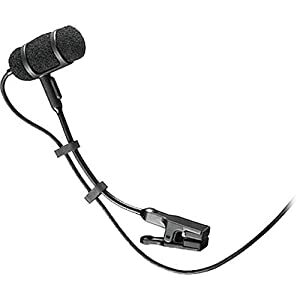 Do you have experience with this microphone or anything similar? I've never went to the dark side yet but Daniel would probably have a lot of valuable info to contribute. Not sure Joe. I do know that the Countryman Isomax pick-up not only works well but is used by many professional sound guys on the gigs that I play at. I developed a special clamp as well that I can set you up with in case you are interested. I'll take a picture of mine and post it later. Yes, adding the mic would make it an acoustic/electric octave viola (or violina, aka Chin Cello). I would much rather use a mic rather than a pickup to capture the full sound of the instrument. I don't need a preamp, equalizer, or phantom power source, I have those available through other means. However, if a parametric equalizer (e.g. Baggs Para Acoustic) is needed to work with this mic it might be a problem.